This week's Tuesdays with Dorie recipe didn't quite make it to the table. You see, my mom, the worlds biggest advocate of whipped cream and other delicious dairy products (i.e. the Raspberry Blanc Manger selected this week) has been a pillar of dietary discipline lately, forgoing everything delicious and remotely sinful for salads and celery, carrots and the like. I'm trying to run from the desserts myself lately, as I'm bound and determined to keep the weight off this pregnancy. I'm finding that 115 degree weather doesn't lead to many desirable outdoor/calorie burning activities besides running from the car to the grocery store and back to the house. So, I decided not to tempt my mom (or myself) too much. However, this apple pie is more than temptation enough- and I've been saving this photos for a while, waiting for the right time to share. Apples are everywhere at my grocery store and so today is the day. 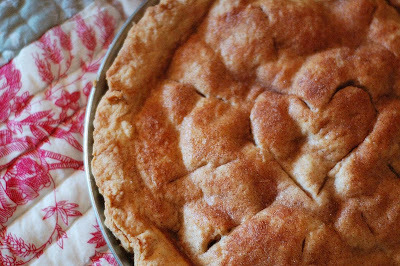 With Dorie's ridiculously delicious pie crust I've loved over and over, more apples than you'd believe would fit in the pie pan, and a round scoop of ice cream on top, I think this will satisfy anyone's dessert craving and cool you down in the process. I'll say, this pie was so good it made a fruit dessert non-believer go back for seconds. So check out the other beautiful Tuesdays with Dorie concoctions and then go get some apples. I'm thinking it's high time I make this again (I'll just leave it at my place to save my dedicated mom from the temptation... and I'll count all those apples and a hearty portion of cinnamon as healthy enough!). Preheat the oven to 425. Peel, core and slice the apples. Put the apples into a large bowl and add the sugar, lemon zest, tapioca (I used Ultra gel), cinnamon, nutmeg, and salt. Toss together and let sit for five minutes. Remove the pie crust from the fridge and sprinkle the crumbs over the bottom of the crust (to help prevent sogginess) and then turn the apples and the juices into the crust. The apples will heap over the top of the crust. Pat them into an even mound. Dot the apples with the bits of cold butter. Lightly moisten the rim of the bottom crust with water, place the top crust over the pie, and crimp together after cutting overhang. Use a sharp knife to cut slits into the top crust. Brush the top crust with a little milk and sprinkle with cinnamon sugar. Bake the pie for 15 minutes (at 425). Reduce the heat to 375 and bake for another 50 to 60 minutes, or until the crust is browned and the juices are bubbling. Check on the pie after a half an hour or so to make sure it’s not browning too quickly (use a foil tent in that case). Transfer the pie to a cooling rack and let it rest until just warm. Serve with ice cream. 115 degrees? Are you in Vegas? Because it's positively broiling there right now. Anyways, I skipped this one too, no one was going to eat it. And I think apple pie is a superb alternative. I'll have to try that pie! It sounds amazing. Looks perfect. Oh, that pie looks great! 115 degrees sounds miserable. How in the world could you stand to have the over on? My blanc manger is chilling in the fridge, but pie has to be my favorite dessert! I LOVE apple pie and hope to make hers eventually. This sounds soo good! John loves apple pie. I will have to try this soon! 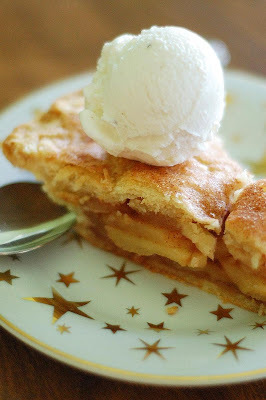 I love apple pie and yours looks terrific! 115 degrees is crazy - I couldn't ever turn my oven on! Really looks amazing apple pie. mmm that looks delicious and healthy to me! Did she/you suggest what apples are best to use for the pie? Looks fabulous!